Bats are considered as pests in Malawi and are actively persecuted. They are not protected even in National Parks and are not considered in conservation management plans. Volunteers can play a vital role in helping us to achieve our aims. We need as much help as we can get to make a difference for bats and biodiversity in Africa, we are a small team with a big task ahead. In return it is our hope that volunteers will enjoy volunteering with us, meet like-minded people and develop some new skills. We are conducting a national monitoring programme as well as conducting a number of smaller research projects about bats and biodiversity. Your time as a volunteer will be spent assisting ABC scientists with field research, community education and awareness including bat trapping and acoustic monitoring, creating a guide to bats in Malawi, roost surveys, habitat assessments, insect sampling, small mammal monitoring, and radio tracking bats (at specific times of year). 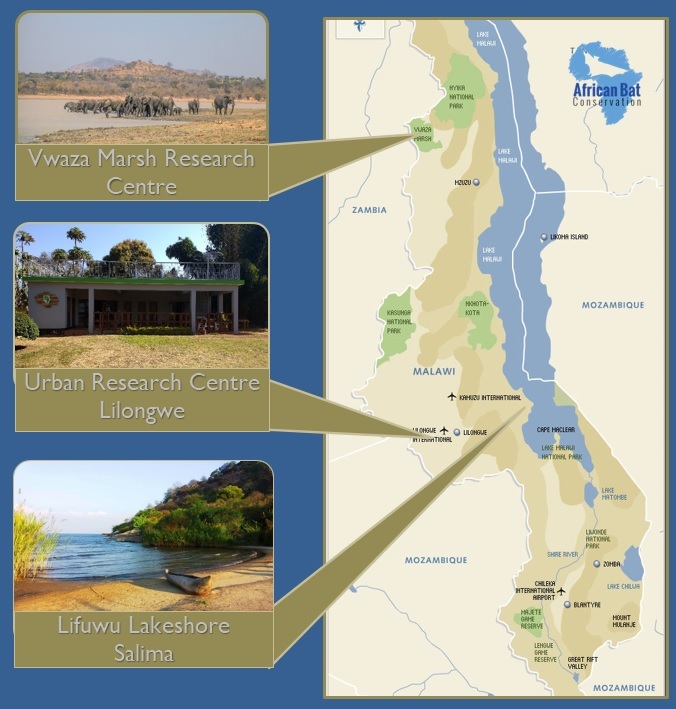 You have a choice of camps with ABC from bush to marsh, all giving you a diverse range of bat research and conservation experience, and also a chance to explore the diversity of culture and environment that Malawi is famous for. We provide a unique opportunity to work with bats and biodiversity research in Africa. There are very few projects working with bats in Africa, and even fewer opportunities to volunteer. Not much is known about African bats, and Malawi is estimated to have over 64 species! This makes your experience even more exciting as we are in unchartered territory in bat research, waiting to discover weird and wonderful new things about bats in Malawi. We are unlike many of the other volunteer opportunities in Africa in that we provide a unique opportunity to work alongside qualified scientists as they conduct novel research on previously unstudied species. field research techniques including bat mist netting, bat handling, wing punch sampling, acoustic surveys, emergence counts, mitigation work, endoscope work, internal roost surveys, insect trapping & pinning, vegetation surveys and radio tracking (only at certain times of year). You can also gain lab based skills including acoustic identification of bats, call analysis and GIS. TRAINING TO BE A LICENCED BAT ECOLOGIST? We can help! If you are pursuing a career in bat research or consultancy you can gain specific skills which can take many years to obtain in Europe including: bat handling, internal roost visits, use of SM3/4 acoustic detectors, harp trapping, mist netting, ringing and wing punch collection; all of which contributes to a bat license in England or Wales. Dr Stone holds a Natural England bat license and would be happy to provide references to augment your Bat License application in England and Wales. Field research: bat trapping and acoustic surveys, ringing, wing punch sampling, GIS mapping, insect trapping and pinning, vegetation and habitat sampling. Roost work: internal surveys, endescope work, roost mitgation work, emergence surveys and acoutsic monitoring. Community work: public and schools based education, awareness and outreach activities. We conduct surveys throughout Malawi, so we travel to field sites to sample the biodiversity most evenings. This involves setting bat, small mammal and insect traps, and conducting vegetation surveys. Daytime hours are spent sorting out equipment, processing and pinning all insect samples and logging all data and acoustic records. We also work in the local communities to conduct roost surveys and carry out questionnaire surveys to establish community understanding of bats and biodiversity. This involves working in the rural villages surrounding the park along with our experienced Outreach Officer. Download our volunteer information pack here for more information about volunteer placements. To book a volunteer placement you can download the application form here and email it to us at volunteer@africanbatconservation.org or you can also email us for a copy of the application form. We will then contact you to confirm receipt of your application, confirm dates and costs and send you a detailed volunteer pack to give you all the extra information you need before arriving.